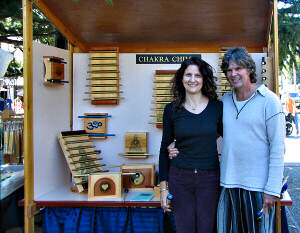 Soul Vibration Instruments is a small family business, operated by Geoff Fishleigh and Annika Lund. It is situated on Saltspring Island, on the west coast of British Columbia in Canada. Geoff was born and raised in Toronto 1960. He attended Sheridan College, taking Woodworking and Design 1982–1985. After college he traveled several years in Asia. Eventually, Geoff found out that, to cope with all the different challenges of human life, a spiritual foundation was essential. In 1986, Geoff settled down on Saltspring Island and started his career as a professional woodworker and cabinet maker. In 1995, his great interest in music inspired him to start his own business, making wooden percussion instruments called marimbas. During his work with marimbas, Geoff explored different kinds of tuning. The modern way of tuning musical instruments is based on the ability to play melodies stretching over several octaves, or to let many instruments of different kinds and tuned to different octaves play in harmony. This is called equal temperament tuning. Such tuning was common in Europe on fretted instruments since the 16th century and has over time outweighed all other kinds of tuning. The equal temperament, however, is not quite harmonic. In fact, practically all intervals between notes are a bit dissonant in this tuning. We may not notice it, simply because we are conditioned to it. In older times, such dissonances may not have sounded acceptable to musicians. They played simpler tunes, but with greater regard to the inherent harmony or disharmony between the notes. In ancient Greece, several ways of harmonic tuning were developed, everyone with its own possibilities and limitations. The Greek philosopher and mathematician Pythagoras is famous for his belief that a divine harmony is revealed by the mathematical proportions inherent in natural phenomena. To Pythagoras, music was a divine language, expressing its harmony in the proportions between notes. The ultimate harmony should be the musical fifth, the first and last tone in the gamut of five consecutive whole tones. Pythagoras was of the opinion that the fifth should be tuned to perfect consonance. When music is played on an instrument tuned this way, he considered the music to have special spiritual and healing properties. This is especially apparent on instruments with long, sustained notes, such as the organ. The organs of the Middle Ages where tuned in the Pythagorean way, as the organ was a common instrument for sacred music played during service in the churches. And still in the 19th century, some musicians considered this tuning superior for the organ. The reason it was abandoned was that it does not allow consonance between notes in intervals that span several octaves, and thus is not suitable for the more complex melodies and orchestration of the later centuries. When Geoff discovered this, he started experimenting with the Pythagorean tuning and the possibility to use the instrument as a healing device rather than for musical amusement. Of course, this would have been possible by reinventing the medieval organ. But although simple compared to the organs of later centuries, even such an organ is a very complicated instrument. Geoff looked for a simpler solution, more like the popular marimba. And so he invented the chakra chime. 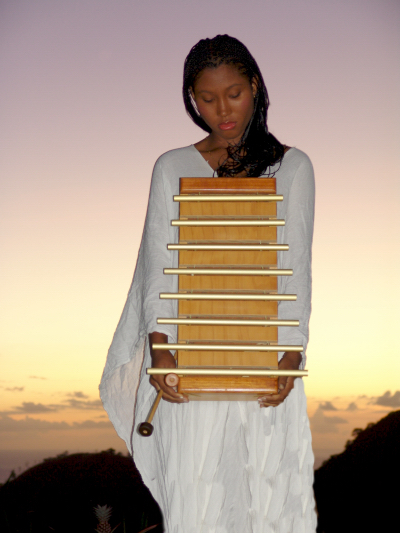 It is simple like a marimba, but its unique aluminum bars produce long, sustained notes of a quite different quality, especially suited for the Pythagorean tuning. Geoff had tried tuning many differnt materials, such as wood, glass, crystal and metals to get the sustaining notes he was looking for. One day driving back from a craft show selling marimbas, while lining up for the ferry to Salt Spring Island, he felt a strong pull to change lanes and to take a different ferry to go to Victoria instead. He felt led to a metalshop in Victoria where he was offered some free samples of aluminum rods, that proved to be perfect for producing the sound he was after. This process of following his intuition has been a big part in designing and producing the chakra chimes. Geoff has been making chakra chimes for the market since 1999. Today he lives with his partner Annika, his daughter Kai, and his dog Sadie on Saltspring Island, where he dedicates his time to manufacturing and selling the chakra chimes, as well as working on the creative endeavour to develop the chimes and find out new ways to use them. Geoff’s spiritual path includes daily Zen meditations and weekly teachings from his Zen teacher Peter Levitt. He does a daily yoga practice and he runs, bikes and hikes most days in the beautiful areas around his home. He attends a weekly men’s group that he has belonged to for over 15 years. Geoff has for the last 5 years explored energy work through the Toltec teachings of don Miguel Ruiz (’The Four Agreements’) and meets weekly with a Toltec group to practice the technique of ‘stalking’. All these disciplines have proven to be very beneficial in deepening his understanding of the energies and effects of the chimes. Many people on Saltspring Island are involved in this work, among them his partner Annika who does all the business administration, most shipping and receiving as well as a fair bit of production work; his teenage daughter Kai and her boyfriend Clay who both help part-time with production; her father Ernie (the designer of this web site); and many friends and collaborators. Annika is from Sweden, as well as her parents Ernie and Maria. They all live on Saltspring, supported by the creative and spiritual atmosphere so noticeable on this magical island.